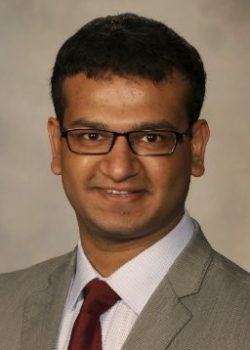 Dr. Arjun Gupta is the Chief Resident for Quality, Patient Safety and High Value Care in the Department of Internal Medicine at University of Texas Southwestern Medical Center, and the inaugural Learning Network Fellow for Costs of Care and the ABIM Foundation. He will be starting a Fellowship in Hematology Oncology at Johns Hopkins University in July 2018. “I arrived in Dallas, Texas in 2014 for my residency after having spent most of my life in New Delhi, India. Throughout school and medical school in India, I had been taught in English so I felt fairly comfortable coming to the US to train. I also spoke fluent Hindi and a smattering of French. Orientation week went by in a whiz and finally July 1—the day where thousands of residents across the country begin their journey as ‘real doctors’—arrived. My amazing senior resident assigned three patients to me and gave me 45 minutes to see them all before going on rounds with our attending. I went into the first patient’s room and had a pleasant conversation with a young man who was admitted with cellulitis. We spoke about his upcoming college graduation, what kind of music he enjoyed (‘everything’) and what he wanted to eat (‘not the soggy fries’). Seven minutes later, I exited the room feeling fantastic. Residency wasn’t so hard, I thought to myself. The next patient was a middle-aged woman who had presented with falls at home and was being evaluated for a myopathy. I discovered that her preferred language was Spanish—not uncommon in Dallas. My Spanish was limited to a few words picked up from movies but I was unfazed. I pulled out my phone and dialed the number of the interpreter service given to us during orientation. After a processing and wait time of approximately 45 seconds, a Spanish interpreter came on. It took another 45 seconds or so for them to introduce themselves to the patient and explain doctor-patient confidentiality after which our conversation began. It was just not the same. It was a new experience for me to communicate with someone—a sick person at that—and try to convey intonations and emotions through an interpreter. I had to clarify so many things: Had she tripped? Was she dizzy? Had she lost consciousness? Had she hurt herself? Did she take a statin? The list was endless. It took a long time and I still wasn’t sure if I had the story right. I didn’t even get to ask her about her perspective before the 45 minutes were up. I hadn’t even seen the third patient! I went back to the rounding room shame-faced and apologized to the resident about not being able to see the third patient. He smiled and said, ‘You’ll soon have the interpreters on speed-dial, no worries, I saw everyone, I got you on rounds.’ Rounds started and finished and life went on. Internship is one of the hardest times of medical training. The hours are long and grueling, and we often had to care for 14 patients on the inpatient service. It was sometimes impossible to speak to each patient with the same thoroughness, especially if language was a barrier. Having to communicate through an interpreter on the phone was not the same and it took too long for a busy intern before rounds. Writing down lab values, ordering blood cultures for a patient with fever, running up to room 1031 where Ms. X was having a transfusion reaction, coming back to the rounding room to call transfusion medicine, running up to 1031 again because you forgot your stethoscope at the bedside, helping the medical student prepare for rounds, being alerted to a potassium of 6.7 on Mr. Y, looking up the dose of nebulized albuterol, getting in touch with the respiratory therapist… it can get crazy. There just wasn’t enough time. Soon, a pattern emerged. I found myself running late for rounds if our team had multiple patients who had Limited English Proficiency (LEP). Sometimes, there would be no time before rounds and I would have to get by with a brief conversation in broken Spanish, sometimes aided by an ever-willing medical student who also spoke little to no Spanish, leaving me to poke at their belly, and ask if they had ‘‘dolor.’’ It was awkward. To help bridge the language gap, I downloaded an app to learn Spanish but 80-hour work weeks with additional time on research did not really allow meaningful learning. An article on Gomerblog, which described how a medical student conducts a history and physical using only the word ‘dolor,’ was a breaking point for me. While clearly overdramatic and fictional, it made me realize that I was failing my LEP patients; I did not know them as well and was doing a disservice to them, and myself, with hurried interviews. I did not have the time or bandwidth to ask about their favorite music bands, foods or dreams. It was just a sequence of questions to try to obtain facts as quickly as possible. It was not the kind of medicine I wanted to practice. Professionalism is one of the six ACGME Core Competencies. One of its sub-competencies is ‘Demonstrating Humanism and Cultural Proficiency.’ I came to understand that LEP patients may need extra time and care, and understanding and acting on this are essential parts of this element of professionalism. So I decided that enough was enough, and I just had to do better. I started waking up 30 minutes earlier and sometimes skipped the long line for coffee in the morning to be able to spend enough time with LEP patients. I got to sit down with them and truly get to know them. I learned about—and tasted—Nopalitos con Huevos for the first time and was invited by a patient to her daughter’s quinceañera. It was so rewarding.